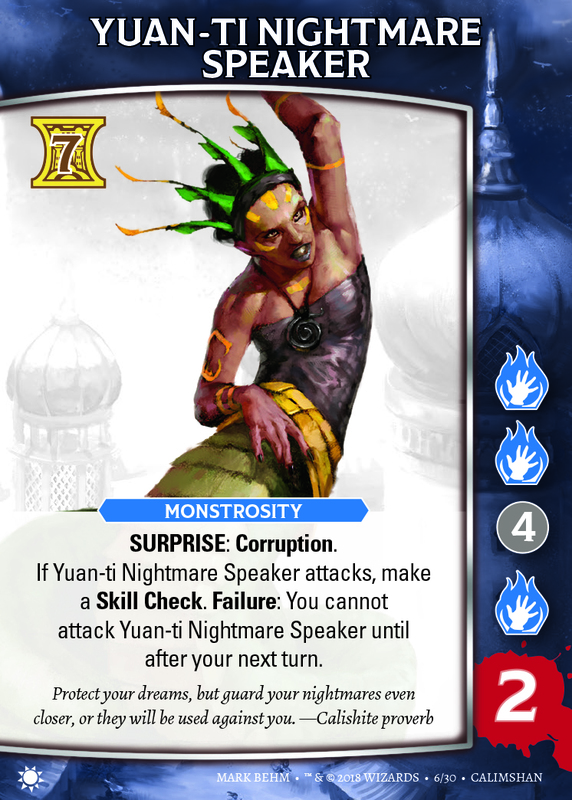 Welcome to Corruption in Calimshan! I hope you’ve been enjoying the Moonshae: Storms Campaign Box. 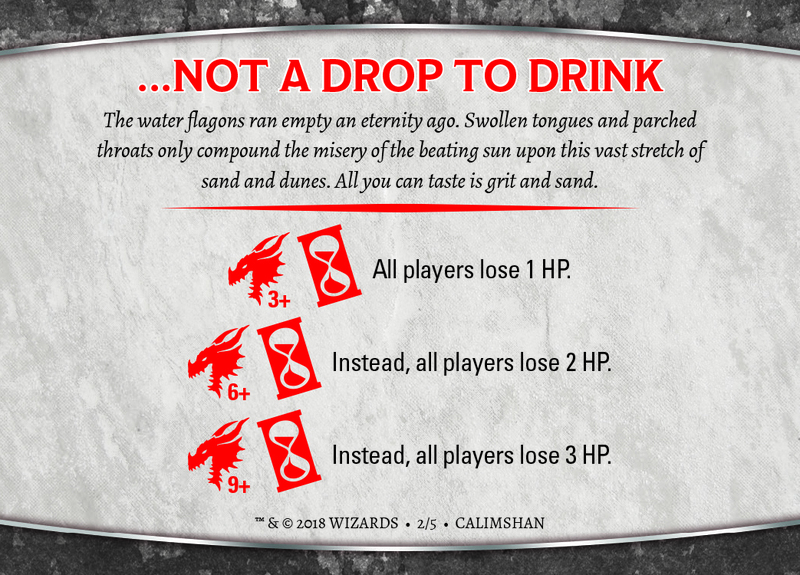 Because it’s time for a jaunt in the mysterious deserts of the deep south…welcome to Corruption in Calimshan! 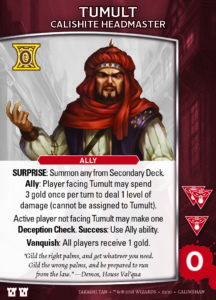 As noted in last week’s blog post, Corruption in Calimshan is officially available on store shelves tomorrow! A powerful efreeti has forged an alliance with a vengeful yuan-ti abomination that recently cemented control of its city as it enacted a transformation into an anathema. They seek to topple Calimshan itself! There’s so much action here, including numerous brand-new elements that make this Adventure Pack unique. Encounters: Mummies, Jackalwere, Thri-kreen, Dust Mephits. All are new encounters you’ll be facing. There’s even five new Difficulty 3 encounters, including a Gynosphinx and its lair, a Djinni, and more. But the stars of Calimshan are the Yuan-ti. 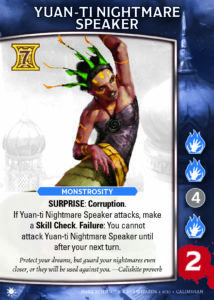 The Yuan-ti Nightmare Speaker is a great encapsulation of that challenge, bringing a new keyword rule to this Adventure: Corruption. 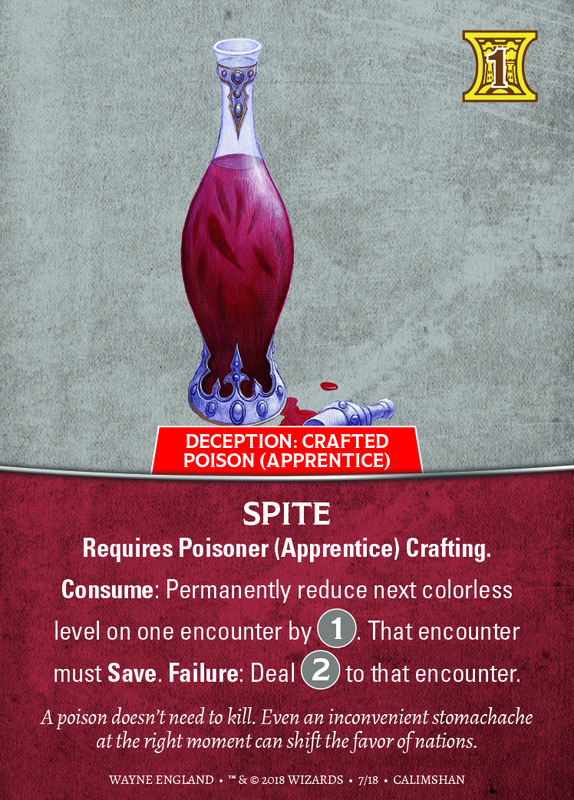 When an encounter with Corruption first faces you, you place a clip on your highest XP Feature, which then cannot be used until all Corruption encounters facing the party are defeated! Market Cards: As usual, this Pack has a card unique to that Adventure, in this case Desert Dweller. 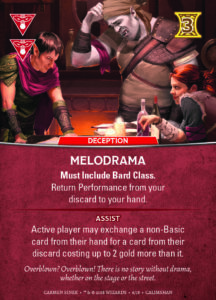 We also include a new Bard card, Melodrama, as well as the usual alternate art for a basic card, Stealth. Because this Pack isn’t already filled with enough new awesome, we then roll out two additional brand new items. The first is Curiosity, which is a card that works with the introduction of the Tabaxi; just as Affable must always be taken by Halflings, Curiosity must always be taken by Tabaxi. Stickers: Two sheets of stickers provide additional copies of the most important Features for your Bard. Additionally, three Poison Crafting Features–each build off of the next–as well as working in concert with the new Crafted Poison card, Spite, conveys new under-handed options of play. Magic Items: A few repeats continue building up a robust catalog of Magic Items, while introducing a few new ones, such as the Quaal’s Feather Token: Whip. 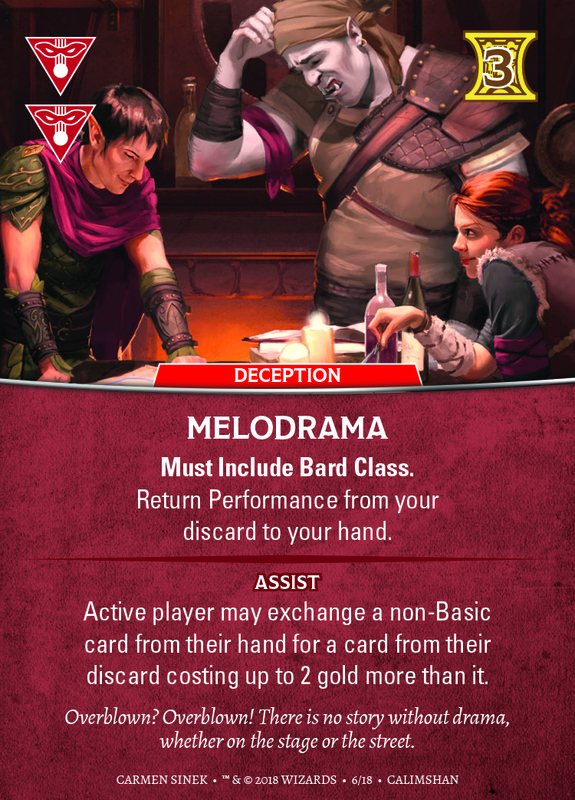 Dragonfire Cards: I’ve mentioned often that Dragonfire cards are so much fun to create and then watch how players deal with the pain and insanity. 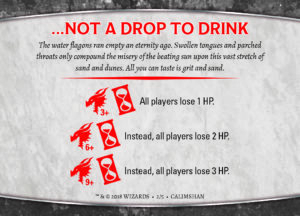 And without a doubt, two of the Dragonfire cards in here–Not A Drop To Drink and A Terrible Storm–are arguably two of the most vicious we’ve ever published. Apropos for the terrible wastes of this far-off land. Character Screens: The two new Character screens for Calimshan are a Dragonborn Bard and the afore-mentioned Tabaxi Bard. 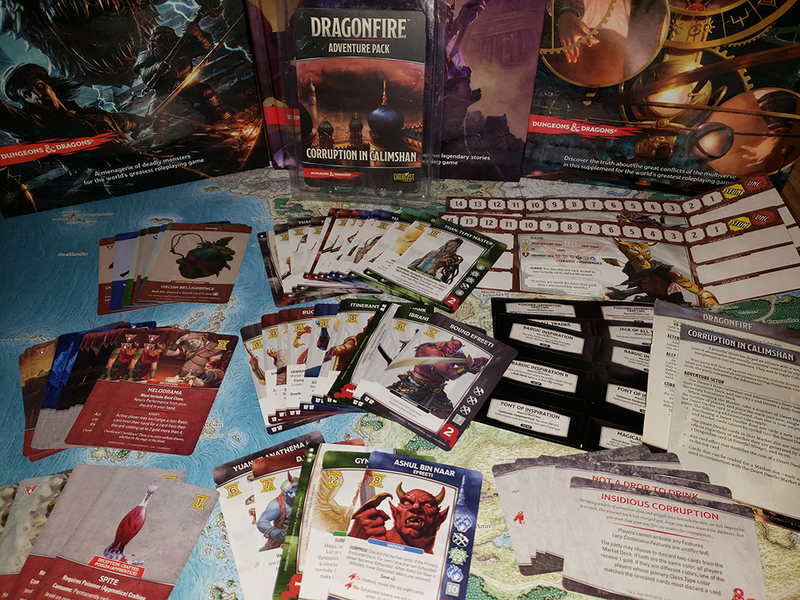 Adventure and Rulesheet: As always, each Adventure Pack includes a brand-new Adventure to take full advantage of the Pack’s contents, while the Rulesheet provides additional clarifications and new fiction. Don’t forget, visit your local game store tomorrow and pick up your pack!